Odin knows a spell called Help, which (as you can probably guess) brings help in times of "sorrow and strife." Odin can heal the sick, and I would imagine it comes in handy for a king of a warrior pantheon, to say nothing of all those worshipers who go off a-viking...ing. Odin learns a spell to blunt swords and stop weapons from doing harm. Again, quite practical, all things considered. Odin cannot be bound by fetters or chains or rope or anything, because he has a spell to break any binding. I bet he got use out of that right off, to spring the noose from his neck. At least, I'd have used it for that, just to you know-- see if it worked. 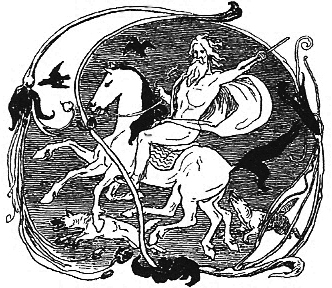 Apparently all Odin has to do is glimpse an arrow as it flies and he can "stay its flight." I think I'd like to consider this KUNG FU AWESOME. Odin is rubber and his foes are glue, because any curse made against him bounces off of him and sticks to... you? Anyway, a spell that turns curses back on their inventors. Not YOU. Unless you happen to be the one carving runic curses against Odin. Odin is also a one-man Fire Brigade, putting out fires with a song/spell. The All-father can soothe the savage beast, so to speak, by calming their hate. It sounds like this particular spell is one that anyone could use -- I'm almost wondering if its something like poetry or some kind of bardic wordsmithery, really. Odin can calm the seas and the wind to protect his vessel. And I think we're going to take a breather here, because it feels like it is getting kind of long. Part II with the last nine will be forthcoming! Probably the next blog post. I don't know about you, but I am never going to forget the curse reversal thing, now that I applied the rubber and glue expression. *Odin sacrificed himself to himself by hanging himself from what is usually considered to be Yggdrasil, the world-tree. (There are a lot of himselfs in that sentence.) It's one of the many ways he accrued wisdom and, it seems to me, the primary source of his magical skills, such as they were. I think I'd like to investigate a few of these...! Very handy stuff! Stay tuned for part two on Tuesday. Odin has a lot up his sleeve!